Be the first to share your favorite memory, photo or story of Godfrey. This memorial page is dedicated for family, friends and future generations to celebrate the life of their loved one. 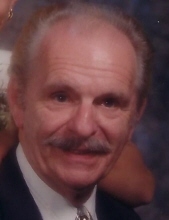 Godfrey Michael "Buck" Priborsky of Aberdeen died Wednesday, October 3, 2018 at Harford Memorial Hospital. He was 89. Born in Baltimore, MD he was the son of the late Garfield & Nancy Priborsky. Mr. Priborsky retired as an engineer for the Sweetheart Cup Company. He was a member of the American Legion Post 128 (Aberdeen), Lynx Motorcycle Club, HCWDA and St. Margaret’s Catholic Church in Bel Air. In his spare time he enjoyed woodworking, country dancing and was an excellent oil painter. He is survived by his wife, Delores J. (Miller) Priborsky; children, Michael Priborsky of Bel Air, Christine Booth of Belmar, NJ, Patricia Gasivwa and husband Rawlings of Bel Air and Lisa Slay and husband Jason of Lancaster, PA; grandchildren, Clifton, Matthew and Austin and his great grandchildren, Mia, Maggie, Maxwell and Maxton. In addition to his parents, he was predeceased by his first wife, Hilda and his siblings, William Priborsky, Nancy Steinert and Gloria Zoubeck. A visitation will be held on Friday, October 5 from 6-8pm at the Tarring-Cargo Funeral Home where a funeral service will be held on Saturday, October 6 at 10:00am. Interment will be in Bel Air Memorial Gardens. To send flowers or a remembrance gift to the family of Godfrey Michael Priborsky, please visit our Tribute Store. "Email Address" would like to share the life celebration of Godfrey Michael Priborsky. Click on the "link" to go to share a favorite memory or leave a condolence message for the family.